Teetering on the western flank of Ter Hill is the corner of an newtake belonging to the old Foxtor Farm, here the gateway overlooks the infamous Foxtor Mires and Swincombe Valley. A few feet away from the gateway stands an old granite cross which is one of the line of wayside crosses that marked the Maltern Way which was a very early monastic track that ran from Buckfast to Buckland abbeys. Although not marked on the OS map the newtake corner and the cross all take there name from the old enclosure – Mount Misery. William Crossing (1987, p.96) records how in 1878 he found the cross lying on the ground in an opening to the newtake, in 1879 he revisited the spot and saw the cross had been re-erected. However, two years later he again called in on the cross and saw it was once again recumbent which he attributed to the moorland cattle using it as a rubbing post or knocking it over during a drift. 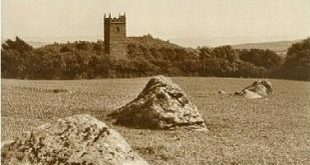 With the help of a bag of cement the cross was finally re-erected and firmly secured into its socket by the Dartmoor Preservation Society in 1885. Today the cross stands at 1.66m and has a circumference of 94.5cm, the span of the arms stretches to 73cm and are aligned on a north – south axis, (Sandles, 1997 p.70). In 1881 Crossing (p.96) describes how he found the head of another cross which some workmen had discovered whilst they were carrying out repair work on the newtake wall, this cross head he suggested may have come from the nearby Childe’s Tomb. Since then there has been much debate as it its origins with a great deal of doubt cast upon Crossing’s theory, sadly the cross head disappeared and so it’s impossible to establish exactly where it came from. The only proof of its existence is an early photograph taken by T. Falcon sometime in the late 1880s in which the head is clearly shown sitting at the bottom of Mount Misery cross – see HERE.